Respiratory syncytial virus (RSV) infection of airway epithelial cells stimulates the expression and secretion of a variety of cytokines including the chemotactic cytokines interleukin-8 (IL-8), monocyte chemoattractant protein-1 (MCP-1), and RANTES (regulated upon activation, normal T cell expressed and secreted). Chemokines are important chemoattractants for the recruitment of distinct sets of leukocytes to airway sites of inflammation. We have shown previously that chemokine expression is regulated in airway epithelial cells (A549) in a stimulus-specific manner in part through the redox-responsive transcription factors AP-1 and NF-κB. In this study, we examined the NF-κB-mediated effects of RSV and the proinflammatory cytokine TNFα on the induction of IL-8, MCP-1 and RANTES chemokine gene expression in A549 epithelial cells. The results demonstrate that RSV induces chemokine expression with distinct kinetics that is associated with a specific pattern of NF-κB binding activity. This distinction was further demonstrated by the differential effects of the NF-κB inhibitors dexamethasone (DEX) and N-acetyl-L-cysteine (NAC). NAC preferentially inhibited RSV induced chemokine expression, whereas DEX preferentially inhibited TNFα induced chemokine expression. DNA binding studies using NF-κB subunit specific binding ELISA demonstrated that RSV and TNFα induced different NF-κB binding complexes containing Rel A (p65) and NF-κB1 (p50). Both TNFα and RSV strongly induced Rel A the activation subunit of NF-κB, whereas only TNFα was able to substantially induce the p50 subunit. Consistent with the expression studies, RSV but not TNFα induction of Rel A and p50 were markedly inhibited by NAC, providing a mechanism by which TNFα and RSV can differentially activate chemokine gene expression via NF-κB. These data suggest that RSV induction of chemokine gene expression, in contrast to TNFα, involves redox-sensitive NF-κB complexes containing predominantly Rel A. Respiratory syncytial virus (RSV) belongs to the Pneumovirinae subfamily of the Paramyxovirodae family of enveloped single-stranded negative sense RNA viruses. RSV infection of the lower respiratory tract cells results in cell death and sloughing into the lumen of the respiratory tree. Worldwide, RSV is the leading cause of infant mortality from respiratory infections and is so highly contagious that by age two nearly all children have been infected. RSV infection in infancy cause severe bronchiolitis and pneumonia and may predispose children to the subsequent development of asthma, the most common chronic illness of childhood . Many studies have indicated that chemokines can play an important role in the onset and severity of asthma and it has been shown that RSV infection of lung epithelial cells increases chemokine production, although the mechanisms involved are largely unknown [2–5]. The chemotactic cytokines, or chemokines, compose a large superfamily of small structurally related polypeptides that play important roles in host defense by recruiting specific subsets of leukocytes to sites of inflammation and injury . Chemokines have been associated with a number of inflammatory diseases and conditions, including asthma, sepsis, inflammatory bowel disease, and adult respiratory distress syndrome [7–9]. The chemokine superfamily can be divided into two major groups based on the position of the first two of four-conserved cysteine residues at the amino terminus, which are either adjacent (CC subfamily) or separated by one amino acid (CXC subfamily). The CXC chemokines such as IL-8 were originally identified as potent activators and chemoattractants for neutrophils, whereas the CC chemokines such as MCP-1 and RANTES mostly attract monocytes and eosinophils respectively . Chemokines are secreted in a stimulus-and cell type-specific manner [11–17] and are regulated primarily at the level of gene transcription [18–24]. The transcriptional promoters of IL-8, RANTES and MCP-1 contain binding sites for the redox-responsive transcription factor NF-κB, which has been shown to be important for their regulation by viral infections and cytokines [18, 20, 23, 25–34]. We previously demonstrated that the chemokines IL-8, MCP-1 and RANTES are differentially regulated in A549 airway epithelial cells [35–38]. 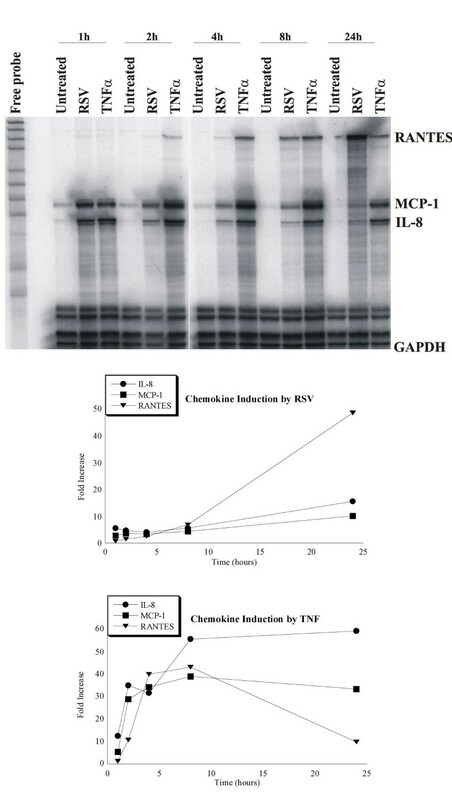 To further elucidate the mechanisms of chemokine expression in A549, we have compared the induction of IL-8, MCP-1 and RANTES by RSV infection with that of TNFα. Our findings suggest that RSV induction of chemokine gene expression involves a redox-sensitive NF-κB signaling mechanism that differs from that mediated by TNFα and involving predominantly the Rel A subunit of NF-κB. Dulbecco's Modified Eagle Medium (DMEM), fetal bovine serum (FBS), Dulbecco's phosphate buffered saline (DPBS), antibiotic/antimycotic, 1% trypsin/EDTA, Hanks Balanced Salt Solution (HBSS) and TRIZOL were purchased from Invitrogen Gibco Cell Culture (Carlsbad, CA). N-acetyl-L-cysteine, dexamethasone, glycerol and MTT tetrazolium salt were obtained from Sigma (St. Louis, MO). TNFα was obtained from R&D systems (Minneapolis, MN). ELISA kits were purchased from Pierce Endogen (Rockford, IL). Human CK5 RiboQuant ribonuclease protection assay kit was purchased from BD Pharmingen (San Diego, CA). [α-32P]UTP (250 μCi) was obtained from Perkin Elmer Life Sciences (Boston, MA). Gel shift assay system was purchased from Promega (Madison, WI). [γ-32P]ATP (500 μCi) was obtained from ICN (Costa Mesa, CA). Antibodies were purchased from Santa Cruz Biotechnology (Santa Cruz, CA). The A549 cell line and RSV Long strain were obtained from the American Type Culture Collection (Rockville, MD). RSV, Long strain, was grown on HEp-2, a human tracheal epithelial cell line. Cells were grown to 50% confluence in DMEM containing 7% FBS and 1% antibiotic/antimycotic. After two washes with 1X DPBS, a minimal volume of RSV, at a multiplicity of infection (MOI) of 1 or greater, containing less than 1% FBS was added. The virus and cells were incubated for 2 hours, after which DMEM was added to bring culture to normal growth volume and 7% FBS. Cultures were then incubated for 48 hours. All plates were scraped and contents were transferred to 50 ml conical tubes. The virus/cell cocktail was vortexed briefly and large debris was removed in a tabletop centrifuge. 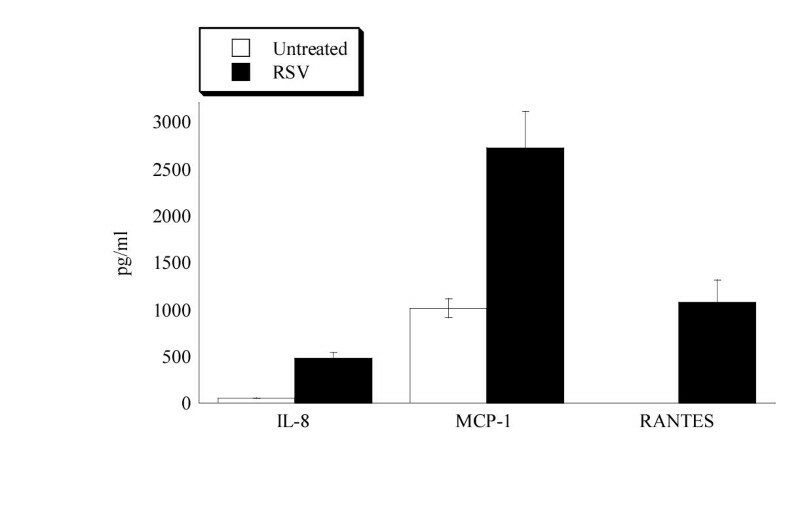 RSV was purified by ultracentrifugation through 30% glycerol in HBSS. RSV stocks were resuspended in HBSS containing 0.5% bovine serum albumin and 100 mM magnesium sulfate and frozen at -70° C.
The A549 human type II lung carcinoma cell line was grown and maintained in DMEM containing 7% FBS and 1% antibiotic/antimycotic. For treatment, cells were grown to approximately 75% confluence, washed once with 1X DPBS and incubated overnight with DMEM containing 1% FBS. Cultures were then washed twice with 1X DPBS and pretreated with inhibitors DEX or NAC in serum-free DMEM to final concentrations as indicated in the figures. RSV and TNFα were added to the DMEM/inhibitor mix to final concentrations as indicated in the figures. One hour after agonist addition, FBS was added to 1% concentration for the duration of the experiment. After addition of RSV and TNFα, cells were cultured for 24 h. Supernatants were collected and spun at high speed to remove cellular debris. The resulting suspension was frozen at -70°C until assayed following manufacturer's instructions by chemokine-specific ELISA (Endogen). RNase protection assays (RPA) were performed using an RPA kit purchased from BD Pharmingen. In brief, total RNA was isolated from stimulated A549 cells with TRIZOL. The hCK-5 multiprobe template set was used to synthesize RNA probes for the chemokines lymphotactin, RANTES, IP-10, MIP-1α, MIP-1β, IL-8, MCP-1, and I-309 as well as the house-keeping genes L32 and glyceraldehyde-3-phosphate dehydrogenase (GAPDH) labeled with [α-32P]UTP using T7 RNA polymerase. 3 × 105 cpm of labeled probe were hybridized with 10 μg of total RNA for 16 h at 56°C. MRNA-probe hybrids were treated with RNase cocktail and phenol-chloroform extracted. Protected hybrids were resolved on a 6% denaturing polyacrylamide sequencing gels and exposed to a Molecular Dynamics detection screen overnight. Laser densitometry was performed using a Molecular Dynamics Storm scanner system (Molecular Dynamics, Inc., Sunny vale, CA). Electrophoretic mobility shift assays (EMSA) were performed essentially as described previously . Briefly, nuclear protein extracts (7 μg protein) prepared form A549 cells by the method of Osborn et al were incubated with 5 × 105 cpm (~0.1 ng) of 32P end-labeled consensus NF-κB oligonucleotide (5'-AGTTGAGGGGACTTTCCCAGGC-3') probe contained in the Promega gel shift assay system for 20–30 min at room temperature in 10 μl reaction volume using the kit provided reaction buffer. To demonstrate binding specificity, 100-fold molar excess (10 ng) of a specific or non-specific oligonucleotide (5'-ATTCGATCGGGGCGGGGCGAGC-3') was included in the binding reaction. Protein-DNA and protein-DNA-antibody complexes were resolved in 5% polyacrylamide gels preelectrophoresed for 30 min at room temperature in 0.25X TBE buffer (22.5 mM Tris-borate and 0.5 mM EDTA, pH 8.3). Gels were dried and exposed to radiographic film with an intensifying screen at -70°C. NF-κB subunits Rel A (p65) and NF-κB1 (p50) were quantified using Trans-AM™ transcription factor assay kit from Active Motif (Carlsbad, CA). The assay is essentially an ELISA in which the consensus NF-κB binding site (5'-GGGACTTTCC-3') is immobilized onto the 96 well plate. Nuclear cell extracts (3 μg) were added to the wells and assayed for either Rel A or p50 binding as per the manufacturer's instructions. Optical density was determined on a spectophotometer at 450 nm. As shown in Fig. 1, RSV infection of A549 epithelial cells induces the production and secretion of the chemokines IL-8, MCP-1, and RANTES. In A549 epithelial cells substantial MCP-1 was constitutively expressed whereas little or no spontaneous IL-8 or RANTES was detected. However, upon RSV infection (MOI = 3) a significant increase in chemokine production and secretion was observed 24 hr post-infection for each of the chemokines. RSV induces chemokine protein secretion from A549 cells. 2 × 105 A549 cells were infected by RSV (MOI = 3) for 24 hr and supernatants assessed for IL-8, MCP-1 and RANTES by chemokine specific ELISA. The histogram shows the mean pg/ml of protein detected from three independent experiments. The error bars show the standard deviation from the mean. To determine whether the chemokine induction was mediated by increased chemokine gene expression we assessed the kinetics of mRNA synthesis by chemokine specific RNase protection. A549 cells were infected with RSV (MOI = 1) or stimulated with TNFα (100 ng/ml) and total RNA isolated at various times post-treatment over a 24 hr time course. As shown in Fig. 2, RSV rapidly induced IL-8 and MCP-1 with steady-state mRNA readily detected as early as 1 hr and continued to increase over the 24 hr time course. In contrast, RANTES mRNA was not detected until 4 hrs post infection after which its expression rapidly increased also reaching a maximum at 24 hrs. The RSV induction kinetics differed dramatically from the induction kinetics for TNFα in the same experiment. Whereas RSV induction of the chemokines did not reach a maximum until 24 hrs, TNFα induction was maximal between 4 and 8 hrs and was either unchanged or lower at 24 hrs post-infection. Chemokine mRNA expression induced by RSV and TNFα. 2 × 107 A549 cells were either infected by RSV (MOI = 1) or stimulated with 100 ng/ml TNF-α. Total RNA was isolated at 1,2, 4, 8, and 24 h and assessed for chemokine expression by RNase protection. Chemokine expression was quantified by densitometry as described in the Methods. The graphs show the time course of chemokine mRNA after normalizing to GAPDH (lowest band in the gel). Shown is representative of 3 independent experiments. The magnitude of induction also differed between TNFα and RSV infection. In general TNFα was a stronger inducer of chemokine expression. This difference was also reflected in the amount of chemokine secreted from the cells (data not shown). Together, these data indicate that RSV infection of A549 epithelial cells induces chemokine expression with distinct kinetics suggesting the mechanism of RSV induction differs from that of proinflammatory cytokines. IL-8, MCP-1 and RANTES gene expression are regulated by the redox responsive transcription factor NF-κB [18, 20, 23, 25–33, 41–44]. The NF-κB signaling pathways have been shown to be differentially affected by antioxidants and glucocorticoid steroids . To determine whether RSV and TNFα induction of chemokine expression might be mediated by different NF-κB signaling pathways we pretreated A549 cells with the glutathione precursor N-acetyl-L-cysteine (NAC) or the synthetic glucocorticoid dexamethasone (DEX). Twenty-four hours post infection, total RNA was isolated and steady state mRNA expression analyzed by chemokine specific RNase protection. As shown in Fig. 3, the two inhibitors had very different effects on chemokine gene expression. Most strikingly, RSV induced chemokine expression was more sensitive to NAC, whereas TNFα induced chemokine expression was conversely more sensitive to DEX. Thus, NAC preferentially inhibited chemokine expression induced by RSV, while DEX predominantly inhibited chemokine expression induced by TNFα. Chemokine mRNA inhibition in A549 cells. 2 × 107 A549 cells were pretreated with 5 mM N-acetyl-L-cysteine (NAC) or 500 nM dexamethasone (DEX). After 1 hr the pretreated cells were either infected with RSV (MOI = 1) or stimulated with TNFα (100 ng/ml) for 24 hr. The graphs show the percent inhibition for each chemokine mRNA after normalization to GAPDH. Shown is representative of two independent experiments. NF-κB binds to the chemokine promoter as either homo- or heterodimers composed of Rel A (p65) and NF-κB1 (p50). Initially we detected TNFα and RSV induction of NF-κB by EMSA (KA Roebuck and LR Carpenter unpublished data) but because multiple gel shift complexes were induced it was not possible to distinguish the individual contributions of Rel A and p50 to the formation of these complexes. Therefore to assess the induction of the Rel A and p50 subunits individually in A549 nuclear cell extracts, we used a subunit specific NF-κB binding ELISA system that utilizes anti-Rel A and anti-p50 antibodies. As shown in Fig. 4, Rel A and p50 subunits of NF-κB are differentially expressed and induced in A549 epithelial cells. In untreated cells, no Rel A (solid bars) was detectable whereas in resting cells constitutive levels of p50 were observed (open bars), suggesting that unstimulated A549 epithelial cells contain p50 homodimers, which with regard to transcriptional activity have been shown to be functionally inert or inhibitory. In contrast, cells stimulated by TNFα (Fig. 4A) or infected by RSV (Fig. 4B) markedly induced Rel A, the transcriptionally active subunit of NF-κB. In addition, TNFα was also able to induce p50 by about 5-fold whereas RSV increased the constitutive p50 level by only about 50%. The induction of Rel A and p50 were specific since competition with either wild type or mutant consensus NF-κB oligonucleotide respectively inhibited or not the RSV and TNFα induced binding activity. These data demonstrate that TNFα is a potent inducer of both Rel A and p50 whereas RSV primarily induces the Rel A subunit of NF-κB. 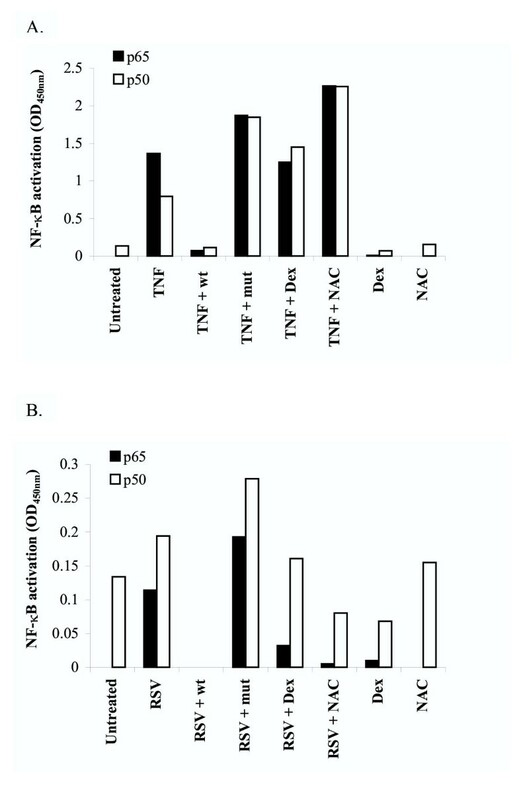 Induction of Rel A (p65) and NF-κB1 (p50) by RSV and TNFα is differentially inhibited by NAC and DEX. 2 × 107 A549 cells were pretreated with 5 mM N-acetyl-L-cysteine (NAC) or 500 nM dexamethasone (DEX). After 1 hr the pretreated cells were either stimulated with TNFα (100 ng/ml) or infected with RSV (MOI = 1) for 2 hr. Nuclear extracts (3 μg) were prepared and assessed for Rel A (p65, solid bars) or NF-κB1 (p50, open bars) binding activity using a Trans-AM™ transcription factor assay kit from Active Motif (Carlsbad, CA) as per the manufacturer's instructions. Graph shows the NF-κB activation results (OD450nm) from A549 cells stimulated with TNFα (A) or infected with RSV (B). An excess of either wildtype (wt) or mutant (mut) NF-κB oligonucleotide provided by the kit was included in the binding reactions to demonstrate NF-κB binding specificity. Note that NAC and DEX inhibits RSV induced p65 and p50 whereas the inhibitors had no effect on TNFα induced NF-κB binding activity. To determine whether RSV and TNFα activate NF-κB differently, we examined the effects of NAC and DEX on Rel A and p50 binding activity. As shown in Fig. 4, Rel A and p50 subunits are differentially inhibited by NAC and DEX which have been shown to inhibit NF-κB by distinct mechanisms. Both NAC and DEX were unable to inhibit TNFα induction of either Rel A or p50. 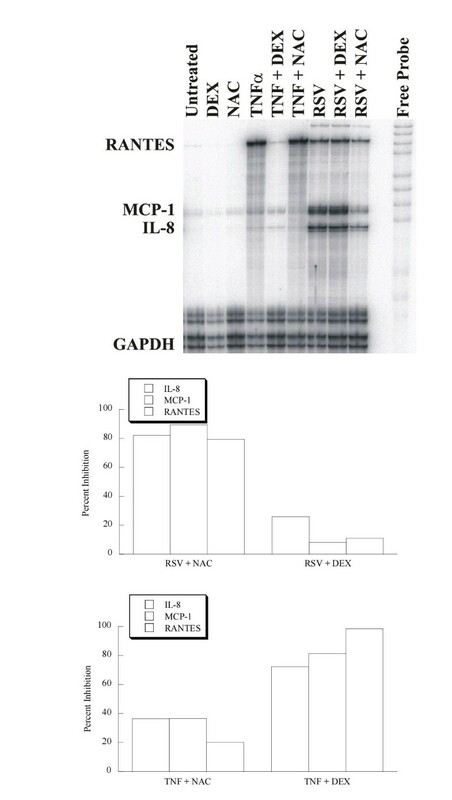 In contrast, in RSV infected cells both DEX and NAC inhibited Rel A and p50 binding activity. However, the inhibitory effects were most striking for Rel A suggesting the inhibitors primarily target the RSV induction of Rel A. The differential effects of NAC on TNFα and RSV induced NF-κB binding activity correlated with its effects on chemokine gene expression (Fig. 3) and protein secretion (data not shown) suggesting that RSV induces IL-8, MCP-1 and RANTES through redox-sensitive NF-κB binding complexes. DEX also showed differential effects on NF-κB binding activity with DEX preferentially inhibiting RSV induction of NF-κB. However, the effects of DEX on NF-κB binding induced by TNFα did not correlate with its effects on chemokine expression, suggesting in TNFα activation of chemokine gene expression DEX targets another mechanism of chemokine induction not involving NF-κB. In this study, we examined the role of NF-κB in the activation of chemokine gene expression in response to TNFα and RSV infection. The inhibitor studies correlating chemokine gene expression and NF-κB binding activity indicate that RSV, in contrast to TNFα, induces IL-8, MCP-1 and RANTES expression in A549 epithelial cells through a redox-sensitive NF-κB signaling pathway that appears to involve predominately Rel A. IL-8, MCP-1 and RANTES are known redox regulated genes and our results are consistent with the findings that oxidant tone can regulate chemokine gene expression in RSV infected airway epithelial cells [46–48]. NF-κB activation is controlled by its inhibitory protein I-κBα which when phosphorylated on ser32 and ser36 marks it for degradation by the 26S proteosome complex. Thus I-κB is a potential regulatory target for the differential induction of NF-κB. Although we have not directly examined the role of I-κB, Fiedler et al[49, 50] have reported differential effects of RSV and TNFα on I-κB activity in A549 epithelial cells. In addition, Bitko and Barik  have demonstrated that another I-κB protein (I-κBβ) may also contribute via a redox-sensitive pathway to NF-κB activation by RSV. In addition to NF-κB dependent regulation there appears to also be NF-κB independent activation of chemokine expression since DEX inhibited TNFα induced chemokine expression but not NF-κB binding activity. Along these lines, it has been shown that RSV activation of chemokine gene promoters involves multiple inducible transcription factors including AP-1 [52, 53], which is also a redox sensitive transcription factor important in chemokine gene expression [28, 36, 54]. AP-1 can also be inhibited by DEX and has been shown to cooperate with NF-κB to mediate RSV induction of IL-8 [46, 55]. The differential effects of NAC and DEX on chemokine gene expression and NF-κB activation suggest that the mechanisms of RSV and TNFα activation of NF-κB and chemokine expression differ possibly involving distinct NF-κB signaling mechanisms. TNFα rapidly and potently activates Rel A and p50 subunits of NF-κB through a kinase-mediated phosphorylation cascade involving a high molecular mass signaling complex called the IKK complex . TNFα activation of the multiprotein IKK complex results in the serine phorsphorylation of I-κB and the subsequent activation of NF-κB . Consistent with the idea of RSV and TNFα activating distinct NF-κB signaling pathways, we found that the NF-κB inhibitor NAC had differential effects on chemokine gene expression. In contrast to TNFα, RSV induced chemokine expression was sensitive to NAC particularly the Rel A (p65) subunit. NAC is an antioxidant thiol that raises the intracellular pool of glutathione the major redox regulating mechanism in the A549 epithelial cell line . Interestingly, it has been reported that NAC can have differential effects on NF-κB binding activity suggesting only a subset of NF-κB binding complexes are redox sensitive . Moreover, it has been shown that NAC inhibits Rel A/p50 heterodimers but not p50 homodimers and can inhibit NF-κB binding to only certain variant κB elements which presumably interact with distinct redox sensitive NF-κB binding complexes . These observations are consistent with our findings that indicate NAC predominantly inhibits Rel A homodimers since that was the major NF-κB subunit induced by RSV infection of A549 cells. Consistent with RSV and TNFα inducing functionally distinct NF-κB binding complexes, AP-1 was recently shown to be the preferential cooperative partner with NF-κB in RSV-induced IL-8 expression , whereas in TNFα-induced expression NF-κB cooperates preferentially with NF-IL-6 [18, 19, 22]. Apparently, the stimulus-specific gene regulation of chemokines is complex involving differential cooperativity of redox sensitive and redox resistant NF-κB complexes with other transcription factors to form unique higher order transcription complexes. Taken together, our data indicate that RSV, in contrast to the cytokine TNFα, activate NF-κB and chemokine gene expression through a redox sensitive NF-κB signaling pathway involving predominately Rel A. We thank Mark Peeples and Larry Thomas for reading the manuscript prior to submission. This work was in partial fulfillment of the doctoral degree of Laura R. Carpenter and was supported by a National Institutes of Health grant AR45835 and grants from the American Lung Association (Blowitz-Ridgeway Foundation).